A geoportal is a type of web portal used to find and access geographic information (geospatial information) and associated geographic services (display, editing, analysis, etc.) via the Internet. Geoportals are important for effective use of geographic information systems (GIS) and a key element of Spatial Data Infrastructure (SDI). Geographic information providers, including government agencies and commercial sources, use geoportals to publish descriptions (geospatial metadata) of their geographic information. Geographic information consumers, professional or casual, use geoportals to search and access the information they need. Thus, geoportal serve an increasingly important role in the sharing of geographic information and can avoid duplicated efforts, inconsistencies, delays, confusion, and wasted resources. A new wave of technological innovation allows to capture, store, process and display an unprecedented amount of geographical and spatial information about the society and a wide variety of environmental and cultural phenomena. Much of this information is spatial - i.e. it refers to a coordinate system and is representable in map form. Current and accurate spatial data must be readily available to contribute to local, state and national development and contribute to decision making, economic growth, environmental quality and stability, and social progress. 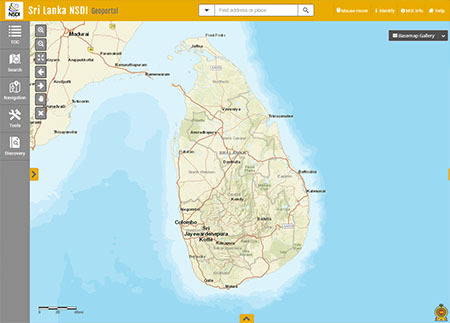 Sri Lanka has, over the past years, produced a rich base of map information through systematic topographic surveys, geological surveys, soil surveys, cadastral surveys, various natural resources inventory programs and the use of the remote sensing images. Further, with the availability of precision, high-resolution satellite images, data enabling by the organization of Geographical Information System (GIS), combined with the Global Positioning System (GPS), the accuracy and information content of these spatial datasets or maps is extremely high. Encapsulating these maps and images into a National Spatial Data Infrastructure (NSDI) has been recognized and the emphasis is on information transparency and sharing, with the recognition that spatial information is a national resource and citizens, society, private enterprise, and government have a right to access it, appropriately. Only through common conventions and technical agreements, standards, metadata definitions, network and access protocols will it be easily possible for the NSDI to come into existence.